one is silver and the other gold....."
Does anyone else remember that rhyme? I don't even know where I first heard it (maybe at school? ), but it has stuck with me all these years. For the purpose of this post, the friends I am referring to are items of clothing and accessories that we love and cherish because of the way they make us feel. Whether it is because of sentimental value, a favourite colour, or a truly flattering fit, we all have things in our closet that we wish we would have, or could have, purchased doubles of, because they get worn often, and we can't bear the thought of them wearing out, or a time when they no longer fit. 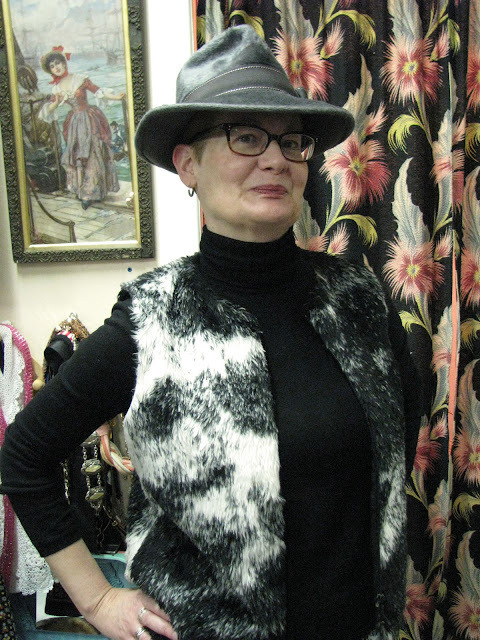 And speaking of old friends - I was in The Sentimentalist, visiting with Melinda, whom I have known for over 20 years, and she was wearing an outfit comprised of many of her favourite pieces, including her patterned dress. Our conversation about favourite outfits started because I mentioned that if I could only wear one outfit all winter, it would be a variation of the one I'm wearing in the photo above - black turtleneck with a funky vest or jacket, short skirt, colourful tights, knee socks, and lace-up boots. The layers are great for variable temperatures, the short skirt and flat boots are good for walking, and getting on and off buses, and the knee socks are just plain fun. In keeping with the theme of old and new friends, I've had the skirt for years, but the vest and boots are new acquisitions this winter and I have grown to love them for their comfort and versatility. Like this fedora, which I have been eyeing for months. I've tried it on numerous times, and each time, end up putting it back on the shelf. It's a beautiful hat, made of fur felt and in great condition, very reasonably priced, but somehow, we just don't seem completely at ease with each other. If I am constantly aware of something I'm wearing, it usually means it's not meant for me. The best friends are those with whom you feel like you can be yourself, and yet, every once in a while, they'll push you out of your comfort zone. Do you have items in your closet that you consider to be old friends, that you could never replace, and always make you feel good when you wear them? Yeah, I call them my go-to items. Mainly a couple of skirts and tees and one or two dresses that always work no matter what. That hat looks good, but you gotta feel good in it or you'll never really want to wear it. I've had to learn that lesson the hard way a few times. Great post! I have a favorite black stretchy skirt that I would feel lost without. I have always loved having a military inspired jacket in my wardrobe but am on the lookout for a replacement because I cut the sleeves off the one I had to make a vest. But I love that too! Vests are great and I love yours in this picture. Don't think I've seen it before. I've had some black Merrill flat walking boots for a few years that I would be sad to give up too. I'm like you though, or most of us, always on the lookout for new favs! I definitely have pieces like that. I love the new-to-you boots! I just got rid of a pair that was cheap quality and I'm on the lookout for a new pair. You have such a funk look! I love it. I like your funky winter pieces, and I appreciate they're comfy for walking: a good pair of booties and pretty socks make me feel better when rain is pouring! And I haven't many irreplaceable pieces in my wardrobe, except for a pair of red sandals and a pair of lace up booties. Even though some mini skirts, black cardis or a second hand afghan coat were there for ages, they're really expendable! Fabulous both f you, ahhhhhhhhhhhhhhhh. I love, love those boots. This is a great post and perfect timing as I was just thinking about a dress I wear a lot and how sad I will be when it's gone. Then I felt weird for even thinking that. I really dig your outfit today all elements I dig and I too have a love affair with knees highs! Your friends boots are killer and I love that fedora on you....such SASS! I love Melinda's boots and every bit of your outfit, especially those socks! 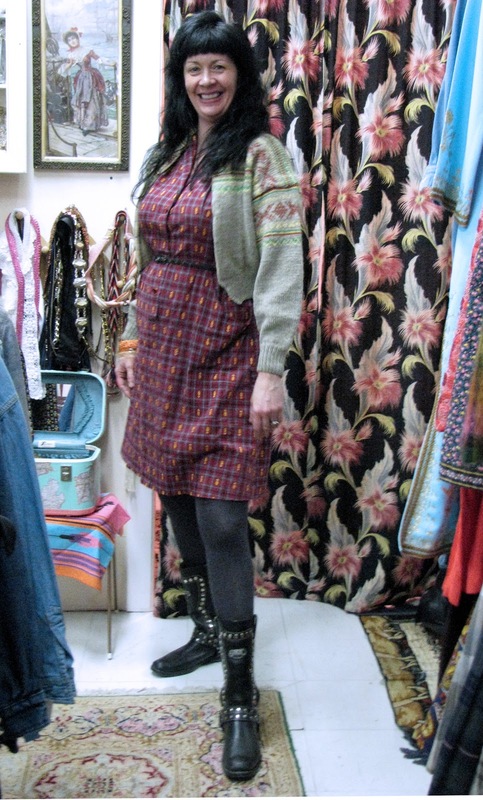 Both Melinda's outfit and yours are wonderful, Shelley - comfortable and cosy and stylish and funky! That little skirt looks amazing on you, you have the legs for short skirts! Great furry waistcoat, and I like the hat on you very much! This is something no one has mentioned, but I have felt that way about underwear. It seems like companies are always changing their styles and shapes slightly so it's hard to find the same perfect thing that finally wore out. I had a Hanro camisole that literally fell to tatters because I wore it so much. I bought another one online, but they had changed the neckline and the feel of the fabric. That first one was the best! 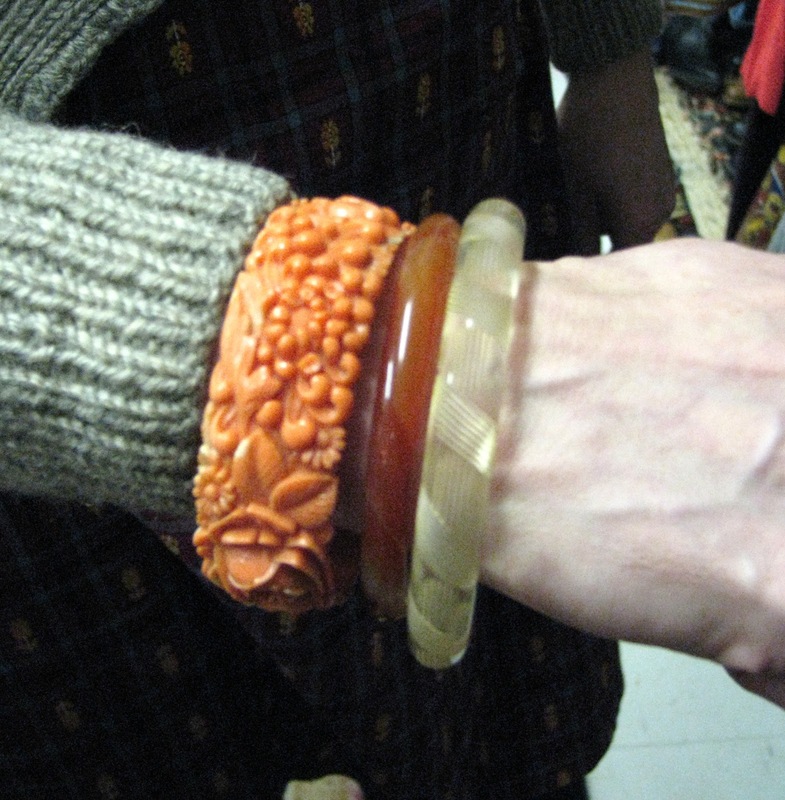 I so agree- some pieces are like treasured friends ...old and new. I love your socks, and Melinda's boots, but best of all, I like to see women like you clearly having fun with dressing. That is how it should be! You look so gorgeous you 2! I love how you put your outfit together Shelley, you inspired me to think even more outside the box! An ode to friends old and new. Human or that which we wear. I love both! And I also think the two of you are stunning in your glorious winter ensembles. I love the fedora, but feeling comfortable is the most important. I love this! 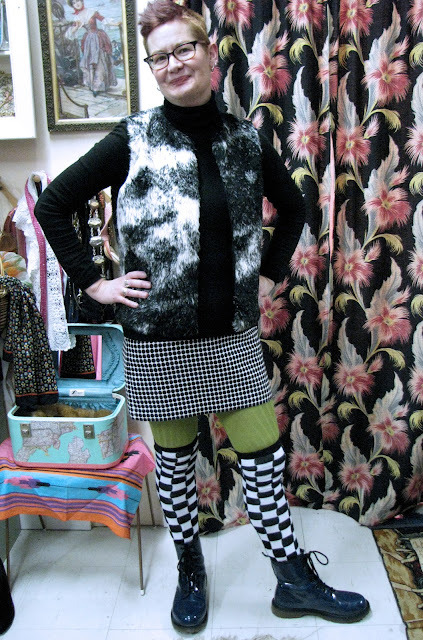 You look fabulous as always, Shelley - I especially love your fab socks and boots (and old fave skirt) and I think you look gorgeous in the hat, but if it doesn't feel right, it just doesn't! And ermahgerd I LOOOOVE those studded boots!! !